As a boy of only twelve years old Hagenauer attended the progressive School of Applied Arts in Vienna and studied under Franz Cizek, who as a teacher was credited with discovering promising artistic talent in young children. Beginning in 1921 Hagenauer studied sculpture at the School of Arts and Crafts under Anton Hanak, who is counted among the best known Austrian sculptors of the 20th century. He was also taught metalwork under Josef Hoffman. Franz Hagenauer worked with his brother Karl in the workshop founded by their father in 1898 in Vienna. The Werkstätte Hagenauer enjoyed great economic success. Many of their works were exported beyond Europe and as far away as the United States. However, with the onset of World War II many of these exports were curtailed. Franz Hagenauer’s greatest fulfillment as an artist lay in sculpture rather than as a designer of everyday metal objects. After the war ended, the Werkstätte Hagenauer expanded its production to include animal figures and beautiful wooden objects. At this time the company coordinated its production with such celebrated architects as Oswald Haerdtl (1899–1959), Karl Schwanzer (1918–1975), and Carl Appel (1911–1997). Upon his father’s death in 1956 Franz Hagenauer assumed the leadership of the company. 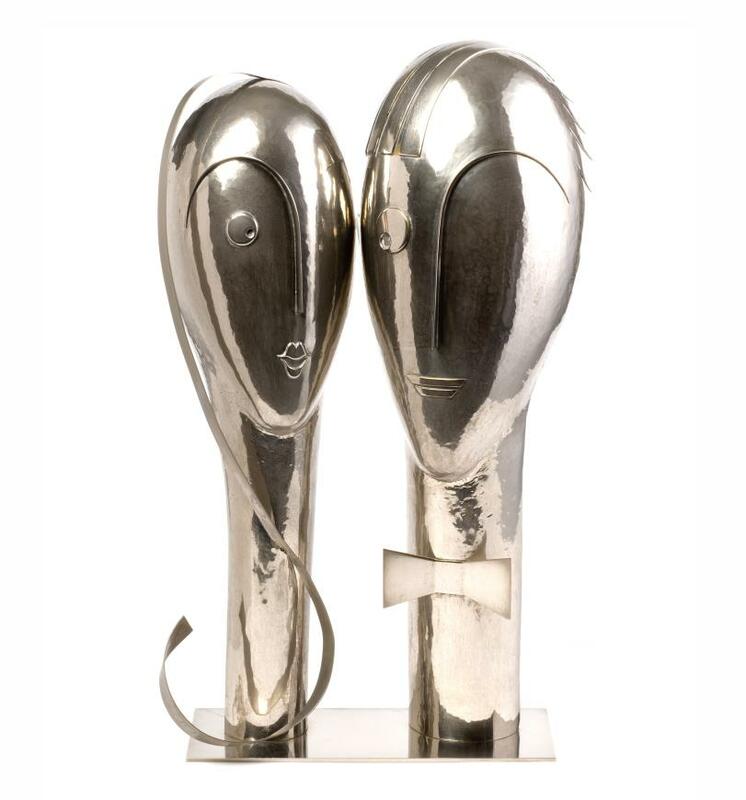 The decorative objects produced at this time met with critical success and international recognition where the brothers Hagenauer received many awards for their designs as at the Triennials in Milan. In 1962 Hagenauer was appointed Professor of Metal-Free Forms at the College of Applied Arts in Vienna. He was celebrated for his small brass figures which have a radically reduced form of expression. When Franz Hagenauer died in September 1986, the company continued operating for another year. Its closure marked the end of one of the most successful chapters of the metalworking industry in Austria. This stunning and major figure piece by Franz Hagenauer is an example of what is most desirable in his rare and sought after designs. Franz was the youngest son of Carl Hagenauer and became a major figure in the Hagenauer workshop. Creations like this hold a singular place in the international market of art deco and craftsman of this time period. It was primarily Franz who upheld the high level of craftsmanship and design within the family. Franz produced a number of these busts which were usually singular figures of women - all marvelously stylized, sleek, modern, glamorous, alluring and whimsical at the same time. As he moved forward in time, the heads took on a Brancusi-like simplicity but at this stage, he played with a hammered surface and enough definition in a few facial features to give narrative and expression to the works. They flirt, primp, pucker and laugh, and they engage any viewer in an instant. There is always a bit of genius as we see in this work with the one long added piece to suggest the hair on the female figure which lends extra grace and sophistication. And the four tufts that jut out on the side of the man’s head along with the use of one line to define his brow and nose. It is choices like these that make his work distinct and that of an artist. Hagenauer gave great attention to how a work sits on a table and came up with many unique ideas as to how the work sits. Here these two figures are joined by a base so that the positioning between the two is close, interactive and one of attraction.